If you're a fiction editor or author, these essential books and websites will help you hone your craft. Not enough? See my list of nearly 200 books on writing and editing fiction. Want more? See my list of books on grammar and style for writing and editing fiction. These dictionaries and style guides are essentials for a fiction editor's toolbox. 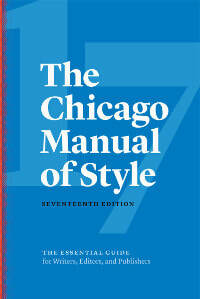 The Chicago Manual of Style 17th Edition is indispensable if you're editing fiction for the US market. This is your go-to source for punctuation, grammar, formatting, etc. The first 100 pages also explain the traditional editing process for publishers. CMOS offers an online subscription that includes access to an online forum. For an American dictionary, Merriam-Webster's Collegiate Dictionary 11th Edition is the standard for editing fiction. Their free online dictionary isn't brilliant, so it's worth buying a subscription if you prefer digital resources. Note that a 12-month subscription is free when you purchase some of their dictionaries in print. For the UK market, New Hart's Rules is the equivalent of the Chicago Manual of Style. 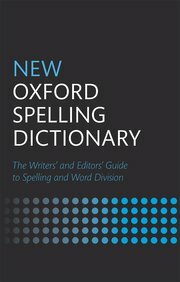 For your primary British dictionary, the New Oxford Spelling Dictionary is designed with the publishing industry in mind. The Oxford Living Dictionaries free website is also fantastic. (Be sure to select the right version of English – US or British/World). For even more word-nerd goodness, the New Oxford Dictionary for Writers and Editors is particularly useful for pinpointing use of italics, hyphens, and common errors. The New Oxford Style Manual combines New Hart's Rules and New Oxford Dictionary for Writers and Editors into a single volume. If you prefer digital resources, purchase a subscription to Oxford Dictionaries Premium (info here, purchase page here) for online access to New Hart's Rules, New Oxford Dictionary for Writers and Editors, an ad-free version of the online dictionary, and many other great resources. Check out my full list of helpful books for fiction editors. Beth Hill's The Editor's Blog is the gold standard for writing and editing advice from a fiction editor, and K.M. Weiland's blog Helping Writers Become Authors is equally notorious as the best advice from a fiction author. You'll want to bookmark the Writer's Knowledge Base, a search engine that rounds up writing articles from all around the web, along with editor Sea Chapman's list of subject-specific blog posts and podcasts gathered from hundreds of sources. The James Patterson Teaches Writing MasterClass is well worth the $90 for 22 video lessons from the world's bestselling author. World-renowned writing teacher Robert McKee, author of Story, runs a website called Storylogue that comes with a steep membership fee, but he's a master, so it may well be worth it to many writers. In historical fiction, it's important that words, expressions, products, and references are not anachronistic to the book's time period. Check word origins at EtymOnline, but if you strike out there, try googling "etymology of XYZ" or "first known use of XYZ." You can use Google Books Ngram Viewer to search millions of cataloged books to see usage trends throughout history (more info here). Merriam-Webster's Collegiate Dictionary also lists dates in a lot of its entries. Grammar Girl Mignon Fogarty's Quick and Dirty Tips is great for quick answers to grammar, punctuation, and style questions. Her answers are very accessible, geared for the average Jane rather than seasoned pro. If you're an editor looking to learn from colleagues, stop by Constance Hale's blog, Constant Comment; Louise Harnby's blog, The Proofreader's Parlour; and Rich Adin's blog, An American Editor. Book Marketing Tools is ace at covering the essential marketing tactics all fiction writers need to employ. Be sure to grab their FREE Ultimate Author Checklist for Online Book Marketing, listen to The Author Hangout podcast interviews with successful authors and online marketers, make good use of their e-book submission tool, and loads more. If you're an indie author, be sure to use the Industry Standards Checklist for a Professionally Published Book, put out by the Independent Book Publishers Association to elevate the reception of self-published and small press books. For books on the publishing, self-publishing, and marketing process, please see this Goodreads list. If you're a romance author going the traditional publishing route without an agent, you can use my Twitter list of 100+ romance publishers to help figure out your submission plans. The book Beyond Heaving Bosoms will get you up to speed on the history of romance publishing. The Dangerous Books for Girls​ website has a plethora of infographics, and the book of the same name offers deeper insight into the romance industry. Nielson, the book industry's top data-gathering company, conducted intensive research on behalf of Romance Writers of America, and the results are shown in a few articles: Romance Readers by the Numbers, Who's Reading Romance Books?, and Opportunities for Publishers in the Romance Book Market. Romance Writers of America (RWA) is huge. Their website and monthly newsletters are chock full of helpful information. Join their local or online writing groups, where you just might meet an invaluable critique partner or beta reader. The RWA puts on an annual writing conference, the biggest in the romance sector, and their annual awards are the highest honor romance publishing. If you don't live or publish in America, membership still has global benefits, including access to their fabulous RWA University: every month they offer their members online forum classes that span topics from writing to marketing to the business-end of being an author, some free and some for $10. In the UK, the Romantic Novelists' Association (RNA) is similar to RWA. They have local chapters, an annual conference, and annual awards. For intellectual analyses of romance novels, check out the Journal of Popular Romance Studies. Although not romance-related, the Alliance of Independent Authors (ALLi) has a lot to offer self-publishing authors. Attending writer conferences is a fabulous way to beef-up your skills and network. Don't miss the list of romance conferences I curate here at Romance Refined! For serious editors, membership in a professional organization gives you clout, and they also come with great benefits. Nearly all of these organizations have annual conferences you can attend as a non-member as well. There are also some fantastic editor groups on Facebook, which have no affiliation to any organization.